This may come as a surprise, but in the late 80s/early 90s, I was more of a fan of Mark Shaw than John Jones. 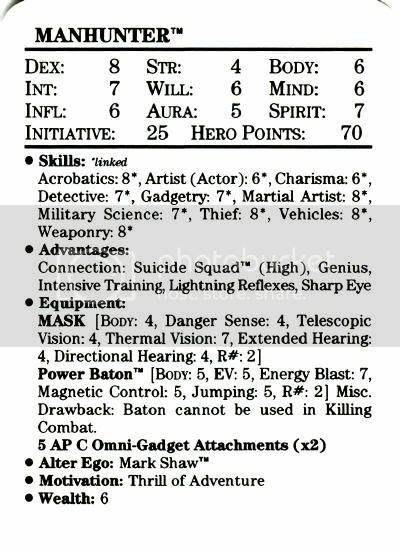 I only made it about halfway through Millenium in 1988, but enjoyed several tie-in comics like Suicide Squad, which led to my buying the spin-off Manhunter series. I enjoyed the premise of a super-heroic bounty hunter very much, but I never saw a second issue on the newsstand, so it was another couple of years before I bought a good chunk of the run through a comic shop. The opening Dumas arc was a very satisfying thriller with a highly effective antagonist, but the book never quite found its stride once Manhunter Mark Shaw settled back into his normal life. In fact, I long operated under the assumption it was intended to be a strong mini-series that was extended into a weak ongoing with fill-ins on both the writing and art fronts, entirely too many tepid crossovers, and no clear direction. Manhunter was canceled after two years, and the character seemingly killed off in the great Eclipso massacre. He had enough fans to turn up alive at the end of the Chase Lawler Manhunter series in the mid-90s, and last I saw he was a mentally unstable supporting character in the Kate Spencer Manhunter series. Have I mentioned there are too many f'n Manhunters in the DC Universe? As far as early protomanga super-heroics goes, you couldn't beat Doug Rice's winning designs. In fact, I had an action figure in the late '80s that looked suspiciously similar to Rice's Manhunter. Unfortunately, nobody else seemed to draw it near as well (see also: the Manhunters of Jack Kirby and Walt Simonson,) and John Ostrander seemed so incapable of reclaiming his groove that he actually resurrected Dumas after a rather final finale. 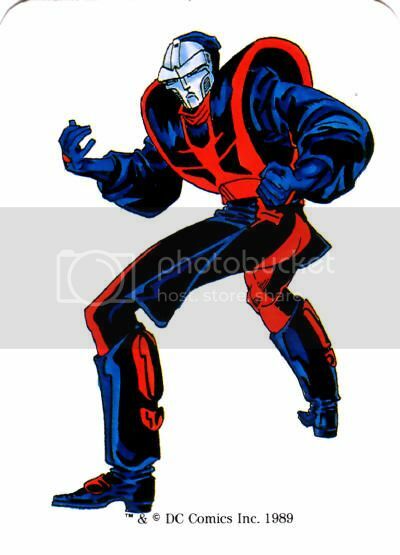 I never realized what stylish duds Manhunter robots had. And they stole Vic Sage's shoes, too. Every time I get about halfway through one of your posts I see fetus Despero and start laughing/getting distracted, by the way. Stylish duds? Oh Gawd no! Manhunter robots have the worst fashion sense! I could do a whole post on it. No, this costume is all Mark Shaw, with the obvious exceptions of the color scheme, mask and baton. Come to think of it, even his equipment was stylized for person use. The Despero fetus was an afterthought, so I'm pleased to hear it raises a smile. Awww yes I remember this Manhunter. In the first issue he nabs Penquin by catching him in the tub then when Penguin asks for clothing Manhunter hands him his top hat. Then they had that one character (Interface I think was the name) who could just touch a compture and make it do whatever they wanted and Dumas was cool upon cool.